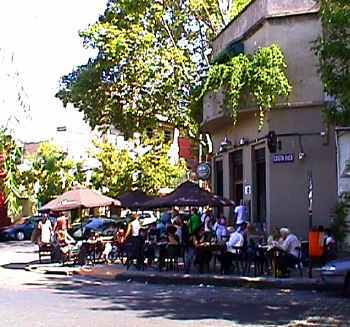 A (Long) Detour through Buenos Aires! Maggie and I met in November 2008 and were married in July 2010. Both of us were transplants to LA. Maggie arrived in 2006 through Teach for America to become a high school teacher. I drove out from Texas in 2005 to attend Fuller Seminary. Before we met, both us knew that LA would not be home forever. Once engaged, we had to ask “when?” When should we pack up and leave this city that has been so good to us? Both of us have stable and rewarding jobs. I have been the Senior Pastor at South Pasadena Christian Church for the past 3 years. Maggie has been an English Teacher at Locke High School for the past 5 years. We are passionate about our work, but in answering when to leave, we realized there was no better time than now. Despite loving our life together in LA, four factors finally led us to decide to leave LA this summer. I have peace about where the church is, and that the leadership there will carry on the mission well. What I felt called to do there, I believe has been done. Now, it’s someone else’s turn to carry it on in new ways. Maggie’s school is closing down after this year. In fact, both schools within the Locke network of schools where she has taught over the years are closing after this school year. We want to raise kids around extended family and we have no family in LA. Our goal is to eventually move to or near Columbus, Ohio, where much of Maggie’s (large) family lives. Separately, both of us have always wanted to live in a Spanish-speaking country for a year or so to become fluent in Spanish. We know that this would be much harder if we already had kids running around. With those pieces of the puzzle coming together we decided that now is the time to make the big move down south. So, in October, Maggie and I will be moving to Buenos Aires, Argentina! That’s right, MOVING. Our hope is to live and work in Buenos Aires between 10 months to 2 years. The length of our stay will depend on a variety of things such as jobs, income, health, comfort, etc. However it works out, this is going to be a long detour filled with adventure, many firsts, and unique stresses before settling down in the Midwest. As you can imagine, moving across the globe isn’t something that can be done well on a whim (unless you’re ridiculously rich). We’ve already started planning for the big move and we have a lot more to do in the coming months. There’s a ton to share with you. So keep up with us and our adventure here at http://www.beforeweage.com. We’ll post tips for others who are making similar moves. We’ll post updates and roadblocks. And once we arrive in Buenos Aires, we’ll post photos, stories, and thoughts about our new life. Subscribe to our blog on the right to follow us. Congrats you guys. From one adventurous couple, to another- we support this decision! Way to Go!!! Congrats! And also Darn You! We’ll miss you tons over at 180! Have fun and stay safe on your adventures together. Lovely! I look forward to following you on your adventure…thanks for the privledge of sharing your excitement. I will be praying for your collective, highest good, Maggie and Stephen. I will miss your dearly. On that first day, when your 6’+ frame in the pew in front of me, was blocking the view of my 6’+ frame, I never could’ve imagined where it was all going to lead to. I’ve had all that I can stand of you now, Pastor Stephen!!! I jokingly say that, but not about calling you my Pastor. We will miss u all very much, however we do understand. Now who am I gonnna rag on after u leave?…guess I’ll go back to Mike Perez….LOL! We wish both of u a Blessed trip & hope all mof your dreams come true. I will miss you lots! God bless you little brother. I know that God will provide for all of your needs. My girls will miss you much and Gerson will miss his brother too. You are part of us now and even if you go far, far, away, know that we are your family. Danny and I will miss you terribly but we understand that you have to go where the Lord leads you. Thank you for what you have done at SPCC. You helped us through a rough time and helped to turn our church around to become a community church with a true ministry in our community. God Bless you and keep you both safe as you travel to Buenos Aires. You will always be in our heart. Don’t worry about the hospitality at the church. . I will keep it going as long as I am physically able. I love you both so much. Good luck. Why is Maggie’s school closing? Hey Mark. It’s a kind of a long story. I think Maggie will be sharing that on a blog post sometime. Not sure when though. Thanks for reading! I think what you guys are doing is awesome! I love it, carp diem. Totally excited for you two. You are blessed, you will continue to be blessed, and you bless those around you. Thank you. Thanks for being a great Pastor and friends, and all the best on your bold adventure, if we don’t see you soon. Hi Frank! Thanks and we’d absolutely show you around town if you make it down! Hope all is well with you and the family. It’s easier to replace Lola with Maggie. HA! But I’m more of the one pushing us to go to BA.